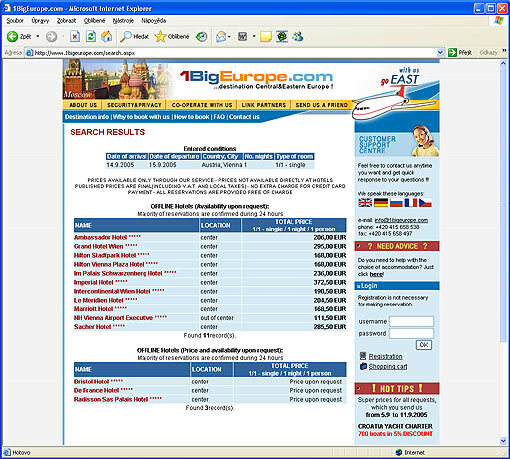 ON-LINE Hotels - some hotels are selling on-line, so you can check availabilities before you book. If there are free rooms, dont hesitate to reserve! OFF LINE Hotels (availabilities upon request) - the most of hotels are offered off line at that moment. It means, if you book a room the hotel will confirm or refuse your reservation mostly within 24 hours, most of reservations are completed within several hours. OFF LINE Hotels (availabilities and prices upon request) - because of special conditions of some hotels we mentioned them without prices on our website. So, YOU CANT BOOK IT THROUGH OUR WEBSITE. It is necessary to contact our Customer Support Center. Also you can check location and the total value of your stay. Please note the search checks the value per person per night in the double room in the hight season. Now you have chosen several hotels to book, but you like to get more information about that accommodation. Just click on each hotel you like to find detailed description.